There are those days when you know it’s just too hot to get out of the house to get something to eat but you still have to eat something and with this haze around and set to stay for a couple more months, I thought I’d share this easy chicken wrap that I made recently since we might be staying home more often. Whether it’s breakfast, lunch or dinner you’re trying to fix, this easy chicken wrap will be ready in no time at all! Here’s the recipe for 1 adult (2 wraps) and you can go modify and double or triple the amount, depending on how many people you intend to feed. 🙂 Just in case you need to know, these aren’t suitable for young kids who haven’t had their molars come in yet (like my boy!) as there’s just too much for those little teeth to handle! Clean and marinate the chicken fillet and set aside. This can be done the night before. Heat the butter/ oil in a frying pan. Add the onions and fry for a couple of minutes before adding in the mushrooms. Stir fry for about a minute and add in the red pepper and chicken. When chicken is almost done, add in the pasta sauce and a pinch of sugar to reduce the tartness of the sauce. Heat the wrap, one at a time, in the microwave for 10 seconds on high. 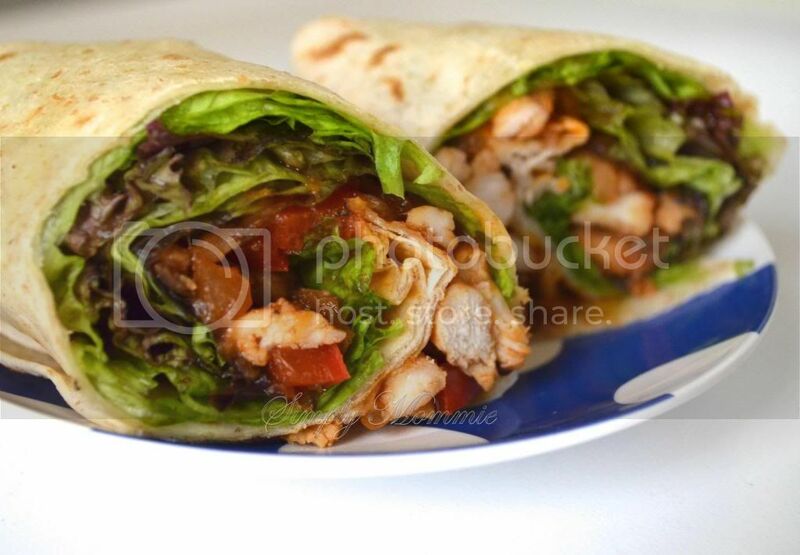 Arrange half the amount of lettuce on one of the wraps and scoop half the amount of the cooked ingredients on it. Top with mixed herbs if desired. Proceed to complete the wrap. Repeat for the other wrap. Slice in half before serving. This entry was posted in 1-dish meals, Breakfast ideas, Chicken, Food for kids, Healthy Snacks, Proteins for the tot, Recipes, Recipes for the family, Sample toddler meals, Vegetables, Western Food. Bookmark the permalink. Where can I get the chicken marinade or is there a recipe for that somewhere here? Hi, is using microwave good? Not sure what you mean but I find it pretty useful. If you don’t have one or don’t like to use one, you can heat up the wrap on the stovetop using a frying pan.